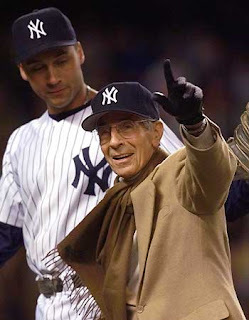 Rough day with the passing of Phil Rizzuto. Listening to the Scooter call Yankees games on Channel 11 growing up was like watching the game with another family member, especially coming from a large Italian family. He was more interested in discussing things other than the game, like the cannoli he just ate, traffic on the GW Bridge or the golf course he played that afternoon. Jeez, he might as well have been a member of my family. He drove others nuts, but Yankee fans loved him like one of their own, which he was. You'll be missed, Scooter. Lots of chatter about schedules after Monday's Media Day. Part of it comes from Randy Edsall revealing his ideal non-conference schedule, which would consist of Boston College, Army, a top 25 caliber team, a MAC team and a Division I-AA team every year. Army is do-able. BC might take some work. Part of it comes from the Runway blog bit about the negotiations with Notre Dame for a game at either Gillette or Giants Stadium. Scheduling can be tricky. Many games are put into effect six or eight years in advance. The Sept. 1 game at Duke is a return from a game in 2004. NC State comes to the Runway in 2012, nine years after the Huskies played in Raleigh. UConn plays Iowa in 2013 and 2014. It's a potentially huge series. But who's to say the Hawkeyes will still be a top 25-caliber team in seven years? If they fall into a couple of 4-8 seasons in a row leading into the series, you know there will be complaints from the less informed as to why Iowa was ever on the slate. Any way, I thought I'd amp up the scheduling talk a bit. Here's a look at UConn's future football schedules. As always, these are tentative dates, and contracts can be dissolved (see Navy) so don't book that flight to Iowa just yet.